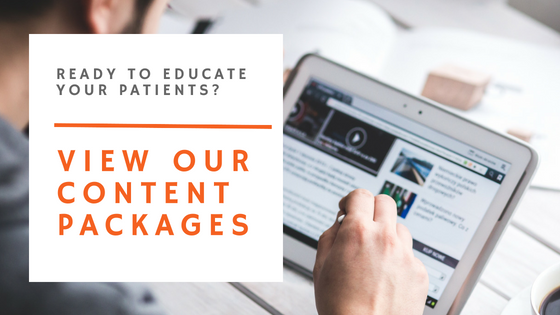 Educate, Engage and Empower Your Patients With Great Content! As a physician, surgeon, practice manager or staff member, the goal of your content is to educate your patients and to provide the answers to the questions your patients are Googling or searching for in the online space. By providing the content that your patients are seeking, it will help to establish trust and credibility toward you and your brand, establishing a positive relationship along the patient journey to the point of them contacting you as and when they require your health services. If we can stress the importance of any marketing service for health professionals, content marketing is it! Splice Marketing has worked with enough health and medical professionals now to know that when we suggest “content”, it’s often met with frustration over the time required to brainstorm, research, write, proof, approve and post. We also know everything must comply with industry rules and regulations and we ensure we comply to that! Use a scheduling tool like Hootsuite to schedule your content to your social media channels over the weeks and months to come. Compliance check – we ensure all new and existing articles are compliance checked to keep you on the right side of the law! Done For You – we create your content strategy reflective of your services, culture, and skills and then write the blog articles, create the videos, design the infographics and animate the imagery. We can then hand it back to you to upload and post or we can manage that part of the equation for you as well! Content Strategy – love writing but need guidance on topics, seasonal and relevant information? We can put together a content strategy for you and hand it back for you to follow and implement. Individual Content Items – need us to create a blog, patient flyer, email, animated graphics – not a problem, we can help. Now we don’t offer a one size fits all approach. We take the time to create content that’s specific to your business, your tone of voice and the type of material that will best portray your message to your target audience. We also ensure all the content we create for you is compliant with industry rules and regulations! Our approach means we will need to work closely with you at the start to ensure you’re 100% happy with what we are producing. Videos – A must have! An exciting and somewhat untapped form of content marketing especially for the health and medical industry. Videos are an effective way of presenting a common problem and offering a solution and educating patients in a few shorts seconds. Video can be in the way of live video, animated videos, professional interview videos – we can help with it all, ask us if you want to learn more. Infographics – An information graphic. An easy to understand graphic that illustrates essential statistics, directions, procedures, health conditions you name it, using icons, imagery, illustrations and design. Images – Splitting up your content with compelling and relatable images is likely to make patients more inclined to continue reading what you have written. Animated Graphics – stand out from the crowd and add a little animation to your images. We guarantee you will see higher engagement than those posts with just an image. Animated graphics are one of our specialities and are a cost-effective way to add some excitement to often a dry healthcare subject. Blogs – An informal and conversational article written on a specific subject. The goal of writing blogs is to offer fresh interesting material to your website or social media page. Information that educates patients in the form of a text-based article. Social media posts – Facebook has become an essential part of digital marketing for health professionals. Having a social media presence allows you to engage with your target audience and promote your brand directly to your followers. The way you structure the content in your posts is important so chat with us to learn more. E-mail newsletters – E-mailing newsletters and your latest blog posts directly to your patient database. This keeps your patients up to date and a constant reminder of your brand and services. Below are some examples of the content types mentioned above that we’ve created for some of our clients. The search engine algorithms (think Google Bots) have become very intelligent in the way then can identify fresh new content. They also measure how informative or relevant your content is by the duration of time spent on your page by a visitor. All these factors allow the Google Bots to determine the relevancy of your content for your patients / clients. Ranking on the first page of Google is the ultimate goal for any business, and content marketing is going to play a huge role in getting you there. A strategic approach to your content, coupled with compelling images, informative infographics, well-written content that is regularly updated as well as the inclusion of video content is going to place you in a much better position than your competitors when patients search for keywords and symptoms related to your industry. Give us a call to hear more on this subject.